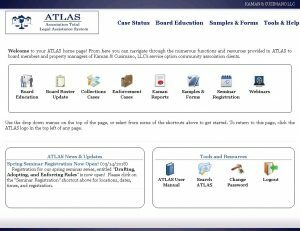 In our never ending quest to serve your association better, Kaman & Cusimano has developed an internet based program entitled ATLAS. ATLAS stands for the “Association Total Legal Assistance System” and its name represents its purpose — to provide legal assistance to our clients. This legal assistance is available to board members twenty-four hours a day and seven days a week, and is included free with your association’s Service Option of representation with Kaman & Cusimano.